The Olympics aren't just about athletic achievement and setting world records — they're also about moments that transcend sports. 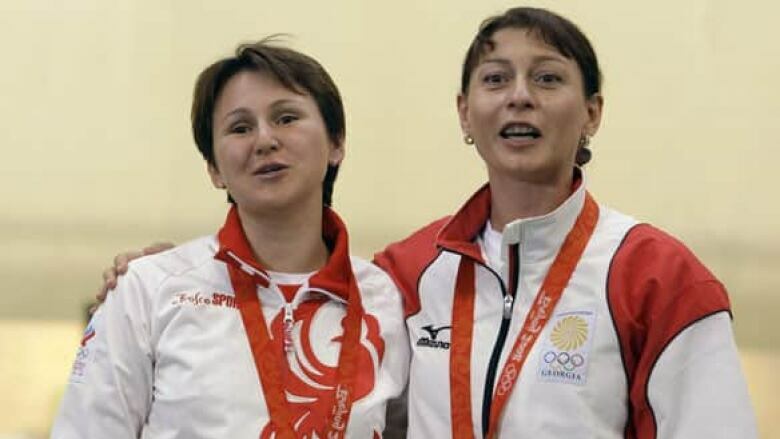 Georgia, Russian shooters embrace — Following the medal ceremony in the 10-metre air pistol event, bronze medallist Nino Salukvadze of Georgia embraced and kissed silver medal winner Natalia Paderina of Russia, even as their two countries' armies fought back in Georgia. Salukvadze's and Paderina's act of solidarity came just hours after the entire Georgian Olympic squad had considered withdrawing from the Games in protest at Russia's role in the conflict over South Ossetia. "That kind of sportsmanship is really remarkable," International Olympic Committee Jacques Rogge said. Whitfield's triathlon silver a team effort — As a triathlete soldiers his way through a 1.5-kilometre swim, a 40-km bike ride and a 10-km run — especially the 10-km run — often the only sounds he hears are from his burning muscles screaming for him to stop, and from his stubborn pride telling them to shut up. But in Beijing, Canada showed there's no need to go it alone. Simon Whitfield of Victoria grabbed the headlines with his electrifying final kick to seize the silver medal in the men's race, but the feat might not have been possible without a little help from his friends. Colin Jenkins of Hamilton, Ont., eagerly accepted his role as Whitfield's bodyguard, keeping rival swimmers and cyclists at a safe distance from his more heralded teammate. Jenkins occasionally dashed out front of the cycling pack to allow the older Whitfield to take advantage of energy-saving air currents. Even Paul Tichelaar of Edmonton, who had made it clear before the race that he would not play caddy, chipped in by feeding Whitfield information on the ever-evolving field. "Our communication was spectacular," Whitfield said. Afghanistan wins its first-ever Olympic medal — In Rohullah Nikpai's war-torn country, pain and agony is a part of everyday life. But Nikpai offered the people of his homeland a small ray of hope when he won Afghanistan's first Olympic medal ever. "I hope this will send a message of peace to my country after 30 years of war," Nikpai said after winning the bronze in the men's under 58-kilogram taekwondo event. Amputee swimmer makes history — Russia's Larisa Ilchenko won gold in the women's 10-kilometre marathon swim, but it was South Africa's Natalie du Toit who made history as the first amputee swimmer to compete in an Olympic Games. Du Toit lost her left leg after a road accident in 2001. She competed in the Athens 2004 Paralympic Games, winning five golds and a silver medal. She'd hoped to race in the Olympics that year too, but didn't qualify. Back then, the open water swim wasn't yet part of the Summer Games, and du Toit lacked the leg power to make the flips and turns at the end of the pool. When the open water competition joined the Olympic lineup, du Toit was confident she could do it — and earned an Olympic berth with a fourth-place finish at the world championships this year, a mere 5.1 seconds behind Ilchenko. "I tried my best," said du Toit, who finished 16th. "I'm not too happy with it, but I'll be back for [the] 2012 [London Olympics]." Finally! A medal for Ian Millar — Just by qualifying for Beijing, Canadian equestrian Ian Millar, 61, secured his ninth Olympic appearance, matching the record for individual athletes. Dating back to the Munich Games in 1972, he has actually qualified for 10 Summer Games, but missed out in 1980 when Canada boycotted Moscow. Millar endured his share of falls and bangs at all those Olympics, but he also turned in many fine performances. Aboard famed mount Big Ben, he was part of Canadian teams that placed fourth on two occasions —1984 in Los Angeles and 1988 in Seoul. But still, there was something missing. Apart from an unofficial gold in 1980, when equestrian events for boycotting nations were held in Rotterdam, Millar owned no Olympic hardware. 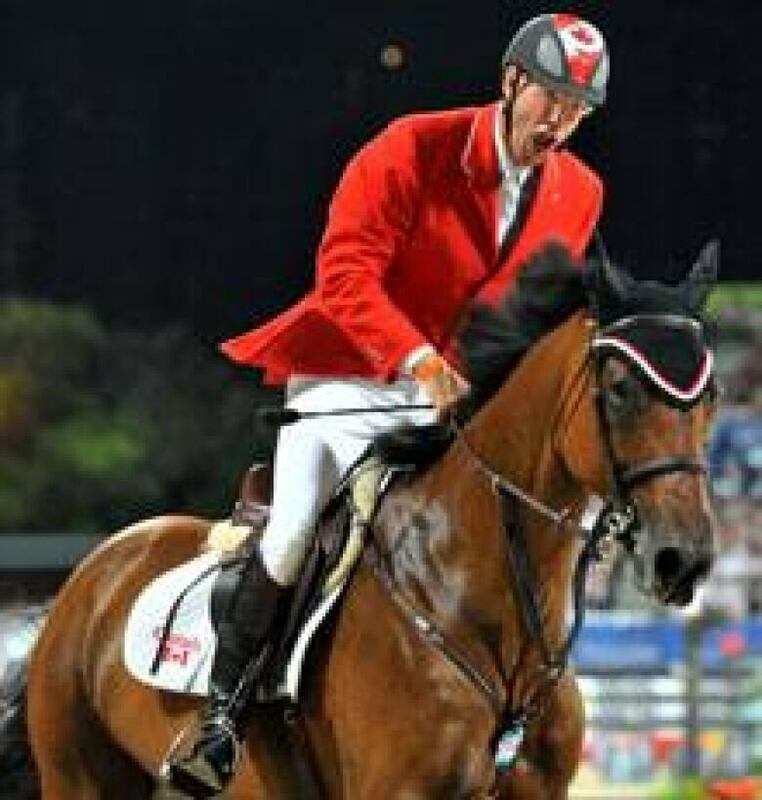 That finally changed at the Beijing Games when Millar anchored Canada to the silver medal in the team show jumping competition, becoming the oldest Canadian ever to win an Olympic medal. "[I've ridden on] many fine teams," said Millar. "Real fine, this one." In some ways, though, it was a bittersweet moment for Millar, who in March lost his wife, Lynn, to cancer. "I had an angel riding with me, that's all I can say," said a teary Millar after accepting his long-awaited medal. German love story — Taking the unofficial title of world's strongest man — the men's super heavyweight class (105 kg) — was Germany's Matthias Steiner, who lifted 461 kg in total in a contest that carried as much emotional weight as physical. The 25-year-old, who was born in Austria, had recently lost his 23-year-old wife, Susann, who was killed in a car accident in July 2007. Steiner had made her two promises: First, that he would become a German citizen, and second, that he would win a weightlifting gold in Beijing. He met the first promise in January this year, and followed through with the second by winning his gold medal at the Games. As soon as he'd won, he kissed a photo of his late wife. Shewfelt shows spirit of a champion — The defence of his Olympic gymnastics floor title didn't go as he had hoped, but Kyle Shewfelt still feels like a champion. The Calgarian, who battled back from two broken legs to make it to the Beijing Games and defend the gold medal he won in 2004 in Athens, failed to qualify for the floor final in China. Though the Shewfelt-led Canadian men's team also fell short of its final, Shewfelt told CBC Sports' Ron MacLean that he was proud of his and the squad's performances, calling them "giant victories." "The dream came true for me in 2004, but this time around there was something different," Shewfelt said. "There was something special, but on a different level." Cochrane breaks Canada's medal drought — Teenager Ryan Cochrane won Canada's first Olympic swimming medal since 2000, taking bronze in the 1,500-metre freestyle in Beijing. Fourth-place finisher Yuriy Prilukov mounted a furious campaign for the bronze over the final few laps, but the Russian was held off at the end by Cochrane. "I knew that [Prilukov] could catch me because he did in the 400 [freestyle]," Cochrane told CBC Sports. "I knew I just had to give my all." It was Canada's first Olympic swimming medal since Curtis Myden captured bronze in the 400 individual medley at the 2000 Sydney Games. The last time Canada won an Olympic medal in the 1,500 free was in 1920, when George Vernot took silver in Antwerp. Victory follows tragedy for volleyball coach — On the final day of the Games, the United States upset the defending Olympic champions to win men's volleyball gold for the first time in 20 years. It was an emotional victory for the players and American coach Hugh McCutcheon, who had to cope with the death of his father-in-law just hours after the Olympic opening ceremony. McCutcheon missed the team's first three games of the tournament because his father-in-law, Todd Bachman, was fatally stabbed and his mother-in-law, Barbara Bachman, was badly wounded while in Beijing. The pair were attacked at a popular tourist site. During their games, the men wore "TB" and "BB" written on their shoes in honour of the Bachmans. Chinese table tennis stars put on a show — With China having already clinched all six individual medals in table tennis, teammates Ma Lin and Wang Hao engaged in a battle of wits. Using a combination of soft pushes and high-speed volleys, Ma scored a minor upset of world No. 1 Wang in the men's singles final. Ma, seeded second in the tournament, won by scores of 11-9, 11-9, 6-11, 11-7, 11-9 in a tense matchup that showcased China's overwhelming skill in the sport. YOUR VIEW: What is your most memorable Olympic moment of the 2008 Beijing Games?